7 AM - 4 PM Pacific Time. There is no substitute for high quality audio. With your speakers seamlessly integrated into your Kitchen, Bedroom or Commercial Office you may now experience all of your audio the way you like & where you like. The MS-21 in-wall entertainment system has a 4 channel (2 zone) on-board amplifier which allows you to easily enjoy your audio system with a variety of sources. You can stream music, watch a movie, check your security camera, listen to the radio, take phone calls and much more from the same unit. 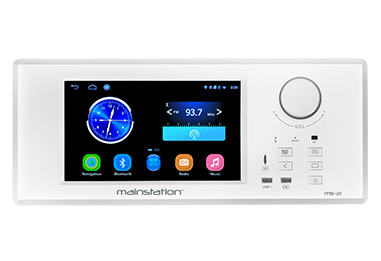 The MS-21 installs nicely in a kitchen giving the user the ability to play audio in the Kitchen and the back yard at the same time and control the volume for each zone separately. The built-in microphone gives you the capability to page your friends and family in Zone B as well. Imagine an instance where you’re preparing a meal in the kitchen while following the recipe on the 10” LCD and listening to your favorite music the whole time. Once dinner is ready you can simply page your family hanging out in the back yard. Your Audio experience doesn’t need to be limited to a small streaming device. With the MS-21, taking pride in your audio experience is right at your fingertips! A/V Input (RCA) - May be used for a security camera.